Several times I have proposed keeping up with the blog by posting photos from my vast archive and writing a quick memory of the context behind the photograph, and today I intend to start that–begin the rhythm of a new blog posting schedule. I went into my photos folder and picked a date at random. And this is the first photo that came up. 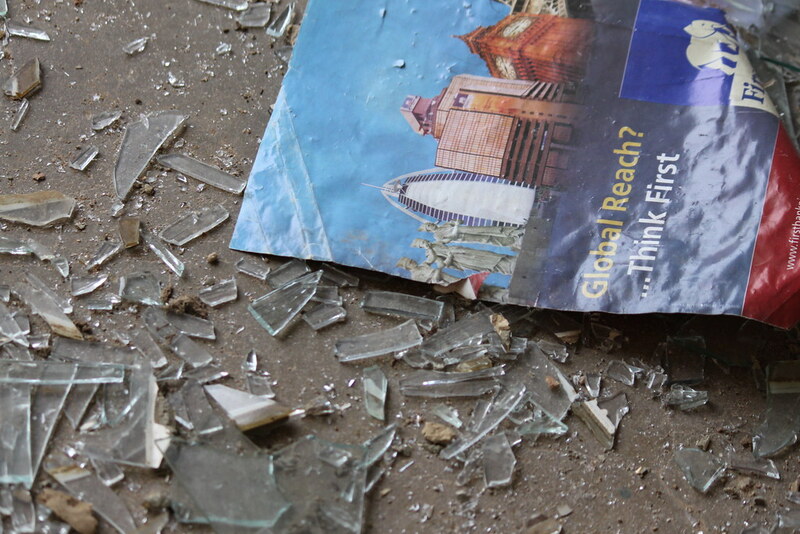 The photo: A bank flier amidst broken glass from a Boko Haram bomb at COCIN Headquarters church. I had been living in Jos at the time, while writing my dissertation, and the church was only a block and a half from my house. It was around 7:15am. I was lying in bed, procrastinating getting up, when suddenly an ear-splitting BOOM came, shaking the house. I lept out of bed, tangling in the mosquito netting. I couldn’t find my keys to run out of the front door, so I ran out the side door. In the sky were thousands of bats. The closed windows in my neighbour’s houses had shattered. We all sat on the ground in a neighbour’s house, listening to the shouting outside the wall. Later that afternoon, when tensions cooled, I walked over to the church to take a few photos. I later wrote about the experience in more detail. With the recent attacks on mosques in Jos and Kano, church in Potiskum, and during a biometric verification exercise for state workers in Zaria, it felt like a the right photograph to post today, expressive of multiple ironies. It expresses the uncertainty that we continue to face about the “global reach” of terror, in a time when ISIS, Al Shabaab, and Boko Haram often seem to work in conjunction (and in a time when more stories of terror against minority populations in the U.S. and Europe are being heard); the tensions of Nigeria’s economic expansion and attempts to join marketplaces of global capital in a time of Boko Haram. And so on. Hopefully, my next photo will be a little more cheerful.